Entering the Blanton Museum of Art takes you into a peaceful atrium of serene blue walls and striking sculptural drama. Dangling from the ceiling, the immense Siphonophora immediately catches your eye—a beautifully strange sculpture inspired by a sea creature that simultaneously functions as one entity and as many. When we entered on our way into the galleries in the quiet morning , the space evoked feelings of peace and connection to the natural world. But over the course of the day, as I saw the space fill with yoga mats and then the chatter of children on field trips, it transformed from an environment of stillness to one pulsing with energy. And I think that reflects my evolving understanding of the role a museum like the Blanton fills in our community. I was there last week to launch a new collaboration between BookPeople and the Blanton to bring thoughtful illustrators like Javaka Steptoe into conversations about the role of art in picture books—and then use those conversations as a jumping off point for further art exploration. The Blanton uses books to facilitate art interpretation in their field trips already, so adding the voices of some of the illustrators seems like a natural and exciting next step. Javaka felt like the perfect artist to start with for obvious reasons. Not only is he the reigning Caldecott Medalist for Radiant Child, he also used Basquiat’s style and material choices as inspiration for his own art in a way that provides kids a really interesting entry point into both the book and the work of an artist like Basquiat. At one point in talking about his process, Javaka said that as the writer of picture books you need to focus on keeping your readers on the path of the narrative, but that as the illustrator you have more freedom to let readers wander and to open new worlds. And I think that’s the overarching goal of this program, to inspire kids to let their curiosities wander. 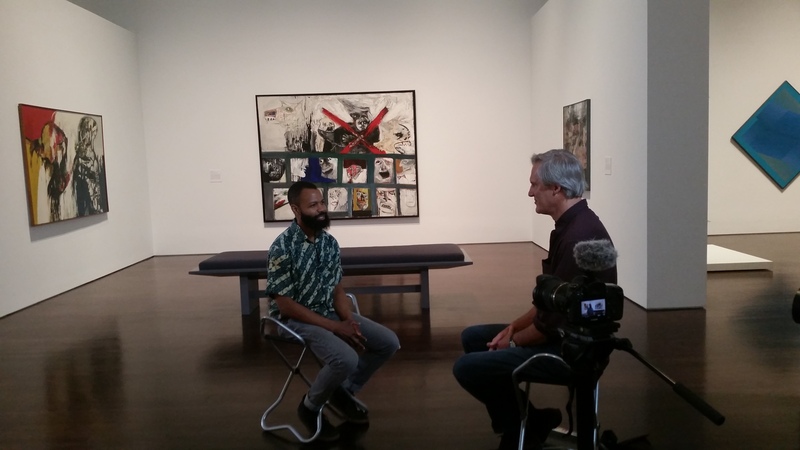 We started the day with a fascinating video interview in the galleries that the Blanton will edit and post once it’s done. Javaka then spoke to a group from Art from the Streets, a program that supports homeless artists and helps them sell their work. The artists had a lot of questions for Javaka about his work, his research, and his experience. And finally we brought in sixth graders from a local elementary school to hear Javaka talk about his book and then use that conversation as background for walking the art gallery. Javaka’s presentation is incredibly fun, guiding the kids through a reenactment of the book and getting volunteers to act out the parts (with hilarious props of course). It was one of the most interactive and engaging presentations I’ve seen, and one that let the kids really enter into the experience. And then Javaka and I joined one of the break-out groups of students for their facilitated gallery walk. I was really interested to hear what the kids would say. Marianne, our guide, took us to four works of art chosen to extend the discussions of Radiant Child and the work of Basquiat. 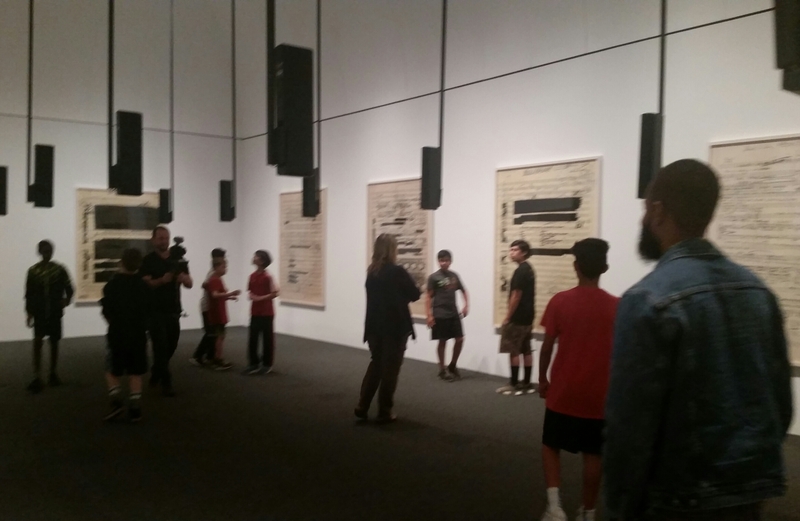 The kids by far had the strongest reaction to a piece by Susan Philipsz called Part File Score, which imposes redacted FBI files over the compositions of persecuted composer Hanns Eisler while motion triggered speakers literally follow you around the room with excerpts of his music. The reaction when we entered was exuberant and experiential, but then they noticed the FBI files and started to talk. 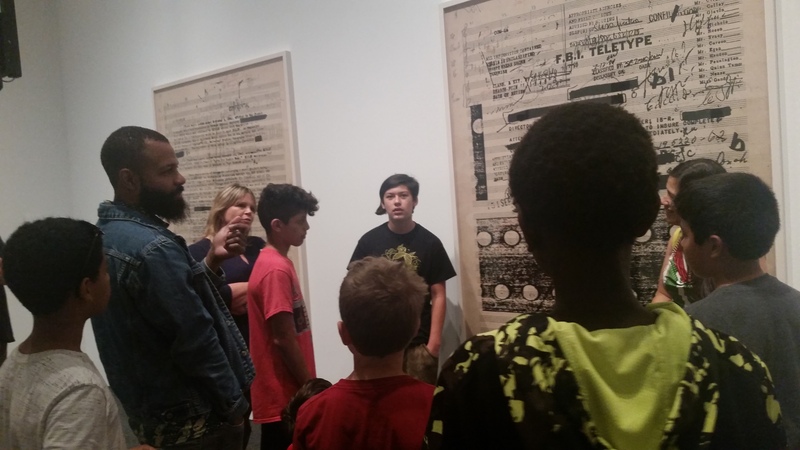 It generated a lot of discussion, with both Marianne and Javaka prompting the kids to think about the layers of the piece’s impact, how the music made them feel, how the experience of the room impacted their emotions. It was a treat for me to tag along. As we left and the kids boarded their buses back to school, Ray Williams, the Blanton’s director of education, was preparing for his next event, a public conversation about using art to foster empathy in doctors and medical students, another aspect of their outreach. And I came away from the day truly inspired. 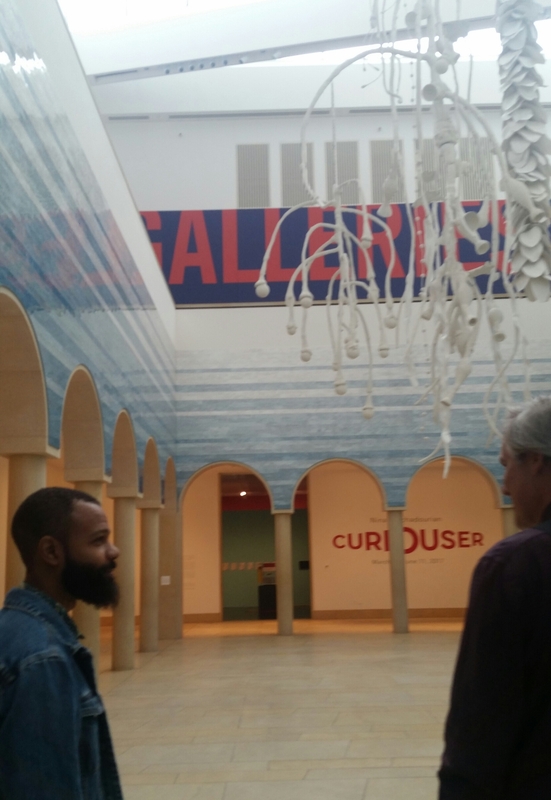 It was a compelling reminder that while museums are valuable places for calm contemplation, as I think a lot of people associate them to be, they also can be vital sources of curiosity and life. As Javaka mentioned to the kids during our gallery walk, “Great art creates places for people to enter into it.” And this day really showed me that so do great museums. I can’t wait to see where this new partnership takes us next. This entry was posted in Uncategorized on April 28, 2017 by Meghan Dietsche Goel.